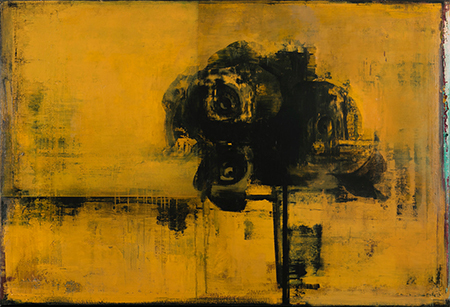 Daniel Brice, "P.P Ochre/Black," 2018, oil and acrylic on canvas over panel, 48 x 70"
In a departure from his typical color block and geometric abstraction, Daniel Brice’s “Polaroid Paintings” are inspired by a single Polaroid of flowers in a vase which was hanging on the wall of his studio. Contained within a suite of ten paintings, the series is an exploration of variations in contrast, color, and shape through the context of one static image. The most literal of the paintings in terms of recognizable form is “P.P. GREY/WHITE SM,” in which the figure of the vase and flowers is clearly discernible, though the color palette is reduced to dark and light greys, with muted hints of green and yellow. The paintings range broadly in size, color, and contrast. In some, the shape of the flowers is clearly seen, while others appear as no more than a ghostly and blurred mass of shapes. Brice layers different hues to create texture and atmosphere, and to explore various approaches to abstraction. The images collectively read almost as silkscreened variations of the photograph, some more precisely executed than others. Individually, each piece contributes to the moodiness and hints at ghostly relics obscured by the vibrant color. Collectively this “variations on a theme” is just downright attractive.